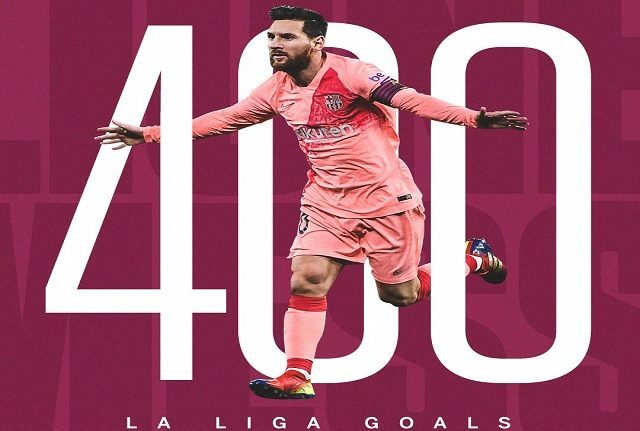 Lionel Messi on Sunday, January 13, scored his 400th goal in La Liga against Eibar to extend his record as the division’s all-time top scorer. Messi, have becomed the first player to score 400 goals in just one of Europe’s top five leagues, could have scored a second but he shot straight at Eibar goalkeeper Asier Riesgo from the edge of the box. It is 14 years since the 31-year-old Argentine scored his first La Liga goal and he has gone on to build an enormous lead at the top of the league’s all-time scoring chart. Cristiano Ronaldo remains the second highest scorer with 311 goals in 292 games while Spain’s Telmo Zarra is third with 251 goals in 278 games.